Monitoring of debris flows using ground vibration sensors has increased in the last two decades. However, the correct interpretation of the signals still presents ambiguity. In the Rebaixader monitoring site (Central Pyrenees, Spain) two different ground vibration stations are installed. At the first station the ground velocity signal is transformed into an impulses-per-second signal (low frequency, 1 Hz). The analysis of the data recorded at this station show that the shape of the impulses signal is one of the key parameters to describe the evolution of the event. At the second station the ground velocity signal is directly recorded at high frequency (250 Hz). The results achieved at this station show that the differences in time series and spectral analysis are helpful to describe the temporal evolution of the events. In addition, some general outcomes were obtained: the attenuation of the signal with the distance has been identified as linear to exponential; and the assembly of the geophones to the terrain has an important effect on the amplification of the signal. 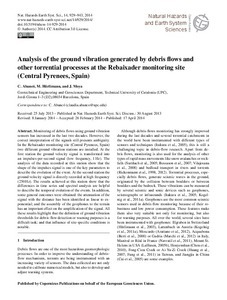 All these results highlight that the definition of ground vibration thresholds for debris-flow detection or warning purposes is a difficult task; and that influence of site-specific conditions is notable. Abanco, C.; Hurlimann, M.; Moya, J. Analysis of the ground vibration generated by debris flows and other torrential processes at the Rebaixader monitoring site (Central Pyrenees, Spain). "Natural hazards and earth system sciences", 01 Gener 2014, vol. 14, núm. 4, p. 929-943.